The Gauteng bouldering scene has seems to be gaining momentum, with the Pretoria boys leading the way. 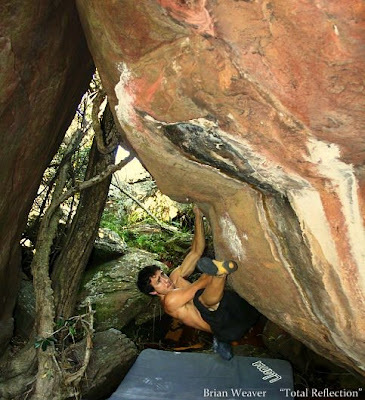 Development has begun at a new area called Bobbejaansberg, where Adam Ludford established "Blindside Arete" 7C+ and Brian Weaver put up "Acrophobia" 7C+. Brian then moved his attention to eZemvelo where he made the 3rd ascent of "Healing Power" 7C+ and opened the area's first 8A, "Total Reflection" after 4 sessions on the line. 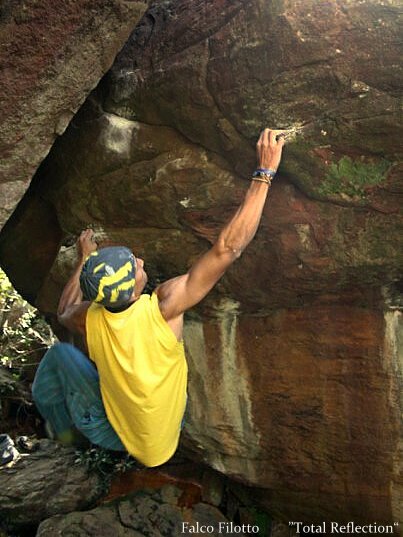 The difficulties of the problem focus around the first few moves, including a very technical and difficult heel hook move, before joining an extisting 7B+ called "Third Reflection". Falco Filotto and PW Nel made the 2nd and 3rd ascents of "Total Reflection" after Brian on the same day, hopefully confirming the grade.